Which would you rather get in the mail? Two weeks ago my friend Courtney Duffey (Architecture) forwarded me an e-mail about this competition that was going to be happening on North Campus called 42-hours of Re_Creativity. We gathered our engineering pals Dan Connors (Material Science and Chemical Engineering) and Ben Mason (Computer Engineering) to form a team. We called ourselves the “Desperate Designers” and operated under the guidance of Art and Design Professor Jan-Henrik Andersen. The competition is a collaborative effort by ArtsEngine and Group Idea (http://michiganidea.wordpress.com/) to bring together and tap the creative power of the North Campus schools and colleges. 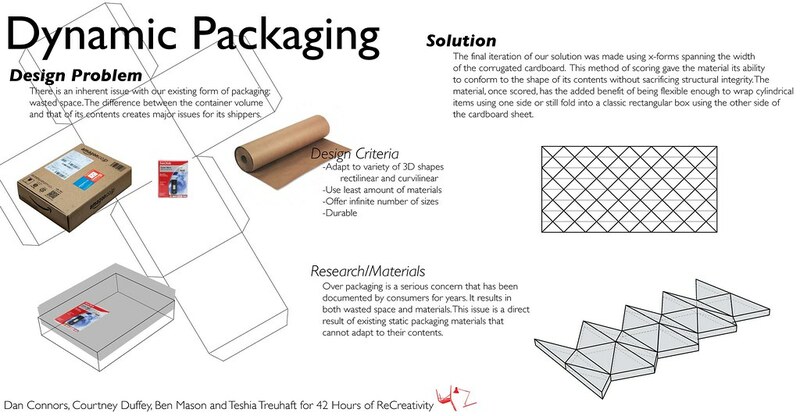 The premise of the competition is you have 42 hours (43 because of daylight savings) to buy/gather only reused materials that collectively cost less than $50 per team. Each team must be made up of three or more students two of which are currently enrolled in a school on North Campus. Ten teams competed and created entries that were judged on the basis of creativity, unconventionality, innovation, concept, completion and aesthetics. Dan and Courtney gathering cardboard at the beginning of the 42 hours. Outlining a game plan for the design on the scuplture studio chalkboard. A little market research on the tail end of a coffee run. Eating too much pizza and lamenting the direction of our project. Ben inspecting the finished product and discussing a closing mechanism for our boxes. Thanks to 42 Hours for a pretty fun competition and some North Campus collaboration!